Autographs for a very good cause! Heath Miller’s 2014 Bid for Hope event took place last night at Off the Hook in Warrendale, PA. The event, for the Glimmer of Hope Foundation, has raised over $1.6 million in it’s 13 years. Proceeds benefit the organization’s “Under-40 Breast Cancer Study”. Ben and several of his teammates not the only attended the event to show their support for this worthwhile cause, but sat down to sign autographs for those in attendance! Thumbs up! 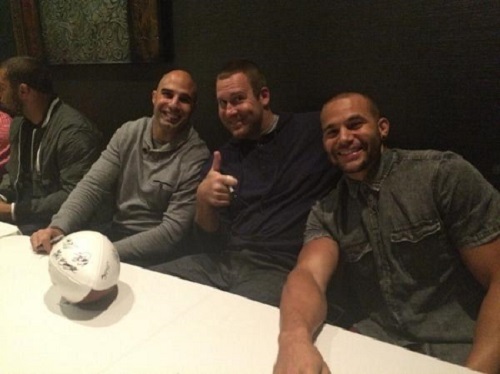 Teresa Varley snapped this photo at the autograph table of Big Ben, Bruce Gradkowski, and Lance Moore – obviously enjoying themselves! You can read her story on the event, see photos and a video all right here. And check out a great fan site for Heath here!